The earthquake in Haiti has set it back by decades. Port Au Prince, its capital city will need to be built from scratch. The devastation cuts across class lines. It is well known that corruption in Haiti is endemic. Even as the country struggles to dig out from the devastation, corruption most likely hampering relief efforts. That is not a problem that will be solved in the weeks or even months ahead. It is certainly not a reason to diminish world assistance to Haiti. There must be long term goals after reconstruction. Haiti must end up stronger. It can not simply pick up where it left off. Haiti has assets that are mostly human and cultural. It has people who are eager to work at wages that are competitive on the world market. It also has beautiful art and music. There are many countries that are economically poor that have marketable cultural riches. There is a democracy to artistic beauty. 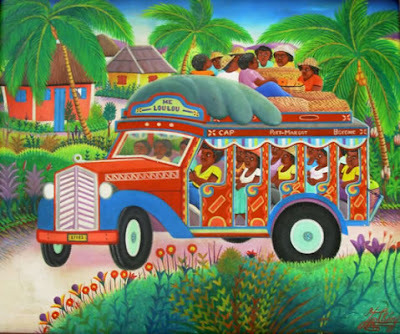 As the world reaches out to Haiti, we should consider creating a market for Haitian art and Haitian music. Entertainment and culture can bring money to a country almost out of thin air, creating a small ripple effect of created jobs. Haitian agriculture is a shadow of what it could be. In the past, impoverished Haitians chopped down trees for firewood and building, magnifying exponentially the damaging effects of flooding. Haiti is not the first country in the world to devastate its own landscape. The Middle East was once far more verdant than it is today. Areas that are now desert were made that way in part through mismanagement. This need not be irreversible. Israel and to a lesser extent other countries in the Middle East have made barren land bloom. The Jewish National Fund has been planting trees since before the state was founded. There is no reason that there could not be a Haitian National Fund, reclaiming barren land, one acre at a time and creating eco friendly ways for the population to heat its water and cook its food. Corporate and individual donations from Haitians abroad could get such an enterprise on its feet. Israeli and American technical expertise could be an important part of the mix. In developing Haiti, it would be wise to have a counterbalance to the local government in efforts to build the country. It could be very helpful to lease tracts of land for 30 years or so to foreign concerns to build not only factories but company towns as well. If working in a factory carried with it the benefit of living in company built houses, it could increase the standard of living and prove to be an alternative to sprawling shanty towns. It could also create a secondary level of employment in businesses serving the community as well as schools, clinics and libraries. It might be possible for company towns to prove hospitable to a new political culture in which development is possible. A time will come when the people who live in such towns will institute changes. That will be an indication of social and political health. There have been missionaries of various denominations working in Haiti for decades. A partnership between them and foreign investors might make for a lot less waste in the efforts to build Haiti. Their familiarity with the culture and the political landscape could smooth the road considerably. There is no problem on earth that is not a combination of the nature of the planet and human character. Haiti is no exception. its political culture and social ills will make the effort more daunting. But that is not a reason to turn away from the long term task of building an economy after the earthquake's devastation. Digging out from the earthquake will only be the start of Haiti's new future. With the help of G-d and a caring world, they should eventually be doing better than ever.